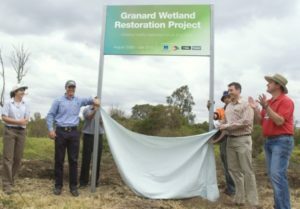 Granard Wetlands are located along Stable Swamp Creek and is one of the most heavily industrialised sub-catchments of Oxley Creek. It is a 5.5 hectare area boarded by the Ipswich Motorway, Granard Road, Marshall Road and Rocklea Bunnings. Stable Swamp Creek passes through the corner of the site before flowing to Oxley Creek just west of the Ipswich Motorway. Over the years Granard Wetlands has been extensively cleared and used as a dump site. It is now struggling with weed infestation. 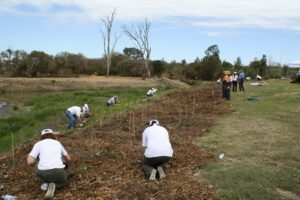 Oxley Creek Catchment Association (OCCA) would like to return Granard Wetlands to a healthy green area that is free of weeds has many healthy native shrubs and trees. Granard Wetlands can again provide habitat for birds and mammals and contribute positively to the water quality of Stable Swamp Creek. An exciting new phase for the wetlands! OCCA is excited by the news that Energex has adopted the site as a voluntary environmental offset for their works in the Brisbane area. Over the next four years Energex has engaged OCCA Biodiversity Services to eradicate weeds, plant 25,000 trees, grasses and shrubs and nurture them until they are able to thrive with minimal assistance. CreekWATCH promotes industry-led care of local waterways. To support the work being undertaken at Granard Wetlands, CreekWATCH has started a CreekWATCH Works team — an on-ground crew of local business people and community members who will once a month weed, plant, water, remove rubbish and generally care for the wetlands. You can make a difference – we need you to become a part of the CreekWATCH Works team! OCCA will provide training, guidance, equipment and coordination. Our CreekWATCH Works team runs every third Wednesday each month, from 8am – 10am. Morning tea is provided. Through signage, social media and promotional material we will promote your business’ participation in CreekWATCH Works.